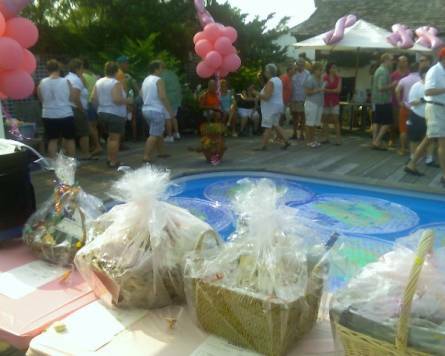 It was a beautiful day the Concerned Women of the Grove ordered for their 12th Annual Fundraiser August 4th. Diane and Pat once again hosted at the divine Heaven and Earth and the pathway was marked from the moment you stepped off the boat. Rather than the Yellow Brick Road, we followed the Pink Ribbons nearly to the end of the Grove. The Pavilions were set up with trinkets for purchase to the left upon entry, and the glorious Silent Auction items were on the right. It was very warm, but not less so than the energy of the people there. Upon entry, you could choose whether to support Gilda's Club or the Stony Brook Cancer Center. And the Grove and guests came out in droves. The Silent Auction was magnificent! How the CWOG manages to top themselves from year to year is amazing! This year the largest areas were sports memorabilia and tickets, original fine art and photos, and the popular Restaurant Row section in the sun porch. On the bayside, many were gathered to take advantage of the breeze. 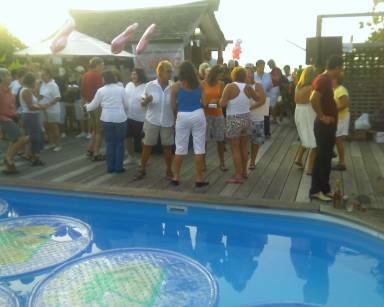 Sayville and environs were barely visible, but in the pool area, Heaven and Earth was swinging! 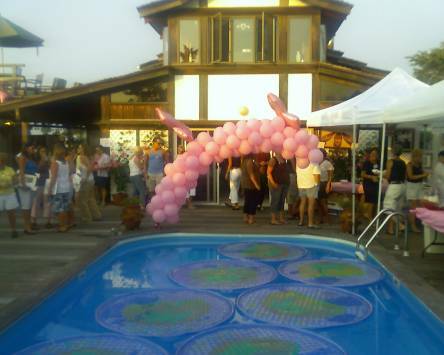 The Concerned Women of the Grove Breast Cancer fundraiser is a grass-roots effort now in it's 12th year. Pat Goff and Diane Romano graciously offer their beautiful bayside home appropriately named, "Heaven on Earth", as the location for this cherished event, that this year, raised $46,000 from a combination of entrance fees, raffles, and a silent auction. The Concerned Women of the Grove is led by Annie Scarpito and her nephew Paul Scarpito. The event is helped each year by an army of volunteers including Mandi & Joe, Bud Henricksen, Mella, Michael, Carolyn & Debbie, Susan & Ruth Freedner. Entertainment was provided by the wonderful Bella. The fundraiser raises money for two charities, the Stony Brook University Carol Baldwin Breast Care Center and Gilda's Club of New York. The Carol M. Baldwin Breast Care Center provides multi-discliplinary service in that the surgeon and radiologist are present on site so that the clinical presentation is correlated with the radiologic findings. Both disciplines review mammographic and clinical findings together (not just by report). Feasibly, a patient can undergo a mammography on the same day as an examination by the surgeon and have results of both findings prior to her going home that day. To develop strategies and lead activities that will enable our worldwide group of independent affiliates to become the premier emotional and social support community for people with cancer and their families and friends. To nurture affiliate network growth and serve as a unifying voice and catalyst to ensure program effectiveness, a quality brand image and the highest standard of operation wherever Gilda's Clubs exist. Gilda's Club is named in honor of Saturday Night Live comedian Gilda Radner, who died of ovarian cancer in 1989. Gilda dreamed that all people affected by cancer, as well as their families and friends, would have access to the same kind of emotional and social support that she received during her illness. The first Gilda's Club opened its signature red door in New York City in 1995. Additional clubhouses have since opened in dozens of large cities, small cities, and several points in between. Gilda's Club has helped change the lives of tens of thousands of members, restoring a sense of control and enriching the entire family. Gilda's spirit lives on at every Gilda's Club. Keep supporting Breast Cancer Awareness and also the Concerned Women of the Grove! The Fundraiser will go on until there's a cure.